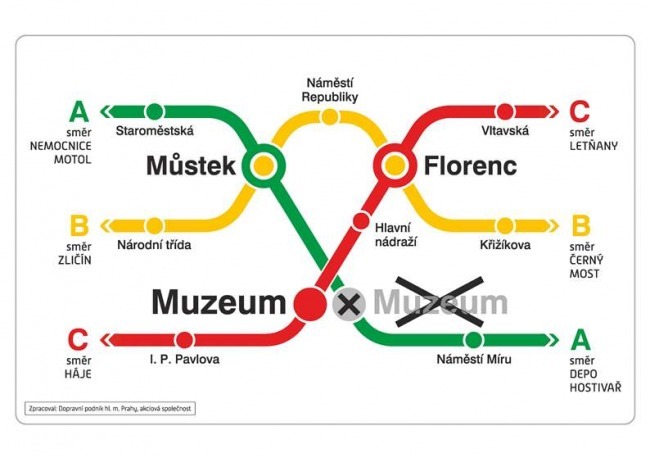 Due to reconstruction, the metro station Muzeum on line A is closed in both directions from Saturday, the 14th of April 2018 (from the launch of the operation) to Sunday, the 15th of April 2018 (to the end of the operation). Trains pass the station. For exit to the area of Wenceslas Square the station Můstek can be used. For transfer from line A to line C we recommend getting off in the station Můstek and then using line B to the transfer station Florenc. For transfer from line C to line A we recommend getting off in the station Florenc and then using line B to the transfer station Můstek. The informational leaflets of several types are issued. They are available from the 10th of April 2018 in the information showcases of the metro stations. Starting on the 12th of April 2018, a warning in form of announcements in the station radio is prepared for passengers. Moreover, on line A the warning will be announced also in the carriages through the train radio, in both Czech and English language. The information will also be published in the Metro daily on the 12th of April 2018. Moreover, the information boards with schematic diagrams and basic information in Czech and English language are prepared. In the area of the closed station, the information clerks in reflective vests, who can advise passengers on the public transport connection in both Czech and English language, are available to passengers (from 8:00 a.m. to 9:00 p.m.).